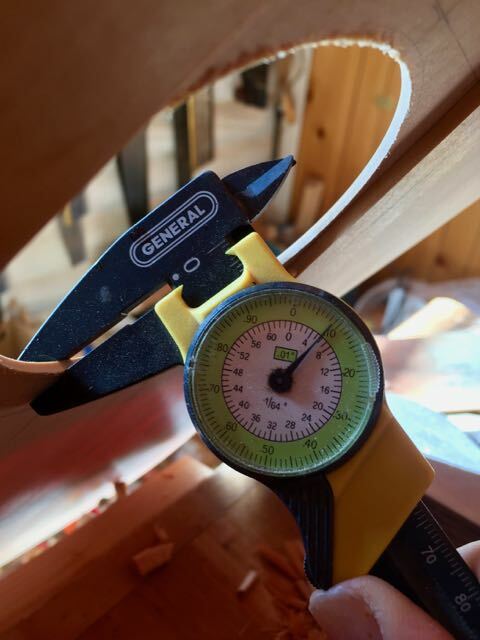 Top thickness is, along with bracing, the most debated and tinkered-with area of guitar making. How thick to make a classical guitar's top is a subject of heated debate. 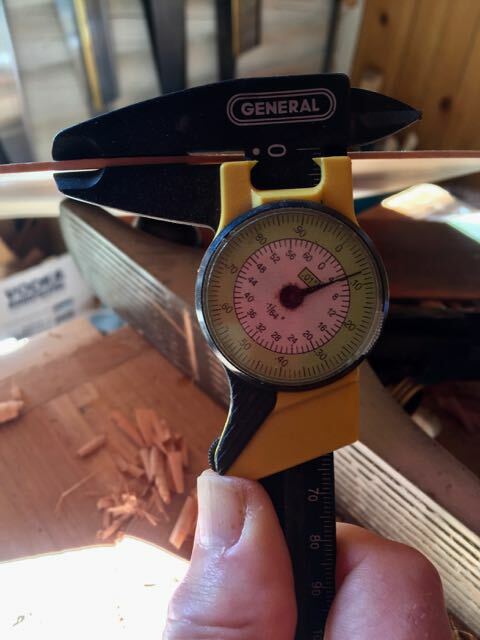 I know, other makers, and amateur classical guitarists, have argued at me about top thickness. I see no point in arguing about top thicknesses, either you like my guitars or you don't. You are suppose to buy the guitar you love. ...Mr. Tatay motioned the young Newberry over to his workbench and, using hand gestures and some coins, indicated to him that the secret to his lutherie was to make the guitar top about the thickness of a nickel in the middle, and the thickness of a dime at the edges. These two coins have been in my jean's pocket for the last two weeks, so I can pull them out throughout the day and feel how thick they are between my thumb and forefinger. a dime is is .046 inches thick, 3/64th of an inch, which would make it between 1.1-1.2mm thick. 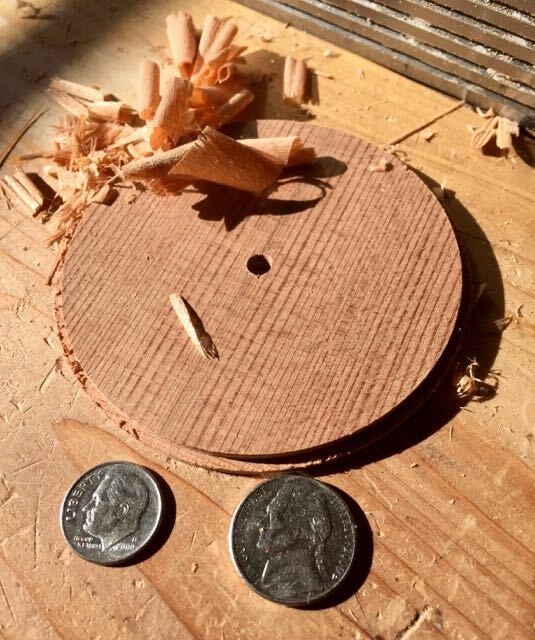 This is a Port Orford cedar guitar top that is going to be paired with some "wild grown" East Indian rosewood. 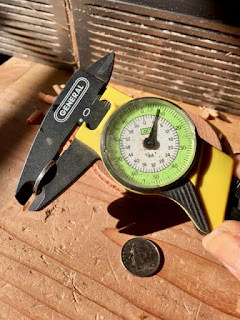 The caliper is on the very outside edge of the top, it measures in between 1/32th of an inch and 5/64ths of an inch, a hair or so over .070 inches, or about 1.8mm. 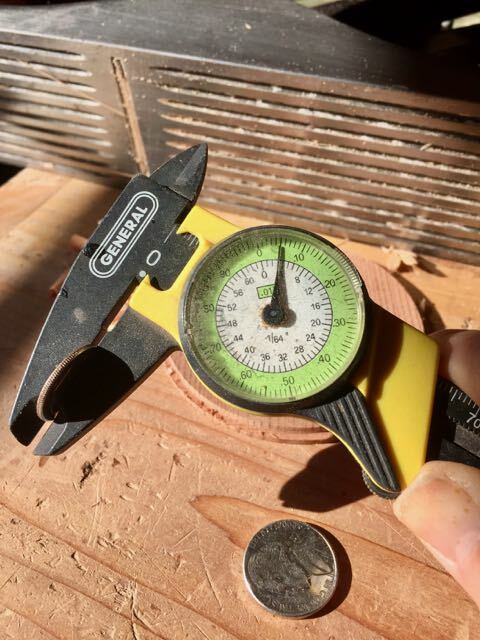 So I got the top's edge to a little more than a thickness of a dime. Just so you know, I made this top last fall, before I read through Mr Somogyi's article. I was using the top thicknesses of Spanish guitars that were made in the 1960's as a guideline. Here at the middle of the top at the sound hole, the thickness is almost 3/32nds of an inch, about .090 of an inch, or somewhere around 2.2-2.3mm. Should I go thinner? Maybe. I won't know until I glue the fan braces on and "tap tune" the top. Remember, Mr. Tatay said about the thickness of a nickel and dime. When the great guitar maker, Antonio de Torres, was asked what his secret was for making such wonderful sounding guitars, he answered by holding up both his hands and put his thumbs to his fore and middle fingers. He said that knowing how to thickness a guitar's top was the secret, which was no secret to other guitar makers. Silviu Ciulei - Nueva Vida (1962 Manuel de la Chica) from Guitar Salon on Vimeo.